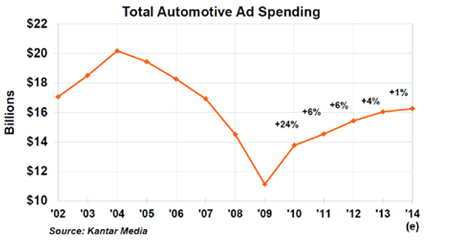 Auto ad spending’s still growing, slowly, with new models and reboots likely to help in 2015. Radio’s automotive ad sales growth has slowed this year, and while the lure of digital may be partly to blame, just-released figures from Kantar Media project total car industry advertising in 2014 will have its slowest growth since the recession. The firm estimates auto advertising will increase just 1% this year with a current pacing pointing to a tally that will reach $16.25 billion. “Total measured ad spending has grown each year since 2010 and is on track to continue that streak in 2014,” Kantar Media chief revenue officer Jon Swallen said yesterday. 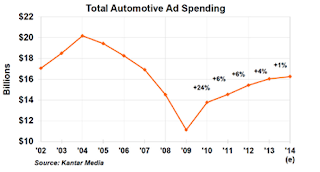 But the post-recession marketing budgets are merely back to what the car industry spent in 2002. Still, it’s considerably better than the low point of $11.1 billion in 2009. “Since bottoming out, ad spending has increased more than 40%,” Swallen noted during a webinar. Manufacturers still spend the most, accounting for about 60 cents of every dollar spent, but regional associations and local dealers have been pumping more money into the marketplace. That’s good for radio since it’s where most of the industry’s auto ads originate. Some groups are experiencing just that. “Auto is an example of an improving trend on radio, up 4% in the quarter with the entire growth in auto coming from local,” Journal Communications president/ COO Andre Fernandez said two weeks ago when the company announced its quarterly earnings. The Kantar data shows car ad spending still tracks closely with car sales. “Post-recession consumer demand for new vehicles has improved sharply and the auto industry has followed suit with higher ad spending,” Swallen said. “The near-term sales forecast remains bullish and coupled with a large number of new model introductions and re-launches that manufacturers have scheduled, auto advertising appears to be on a healthy trajectory into 2015 and 2016,” Swallen said. Radio’s auto lane may be TV’s ‘traffic jam’ of ads. It’s not often that radio can position itself as the uncluttered option, but when it comes to auto advertising a new analysis by Kantar Media may help make the case. It analyzed all the local newscasts on more than 60 television stations in the top 10 markets during April. “The results were quite sobering,” chief research officer Jon Swallen said, pointing to the risky side of a decision by the car industry to put nearly two-thirds of its spending in one medium. The analysis showed 60% of TV auto ads during the local news air in a pod with multiple car commercials and a third were in pods with three or more ads. “On average there were 1.71 auto ads per pod in local news,” says Swallen, noting that means little or no separation between intra-category spots. Kantar doesn’t measure advertising effectiveness, but the suggestion is the competitive ad clutter is likely to diminish how well any given spot cuts through to consumers. Kantar also found some risks to online campaigns, particularly on social media. It found that although viral video can build a buzz that lasts longer that a typical broadcast commercial, an analysis showed that it can also serve to build interest in a competitor. When Ford released its aluminum body F-Series truck last January, its rival Chevy Silverado had a lot more chatter on social media too — even surpassing Ford at one point.